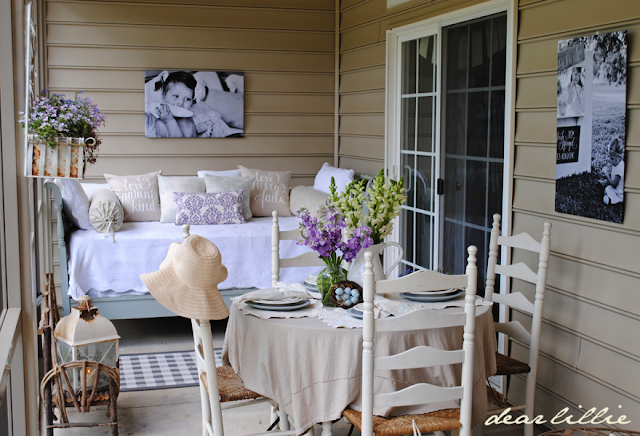 Yesterday I showed you some poster sized prints I added to our porch for a bit of a modern punch. Today I will show you how I made them. This is the single easiest tutorial I think I could ever possibly write. Seriously! In fact, I am not sure it really even qualifies as a "tutorial". The whole project only requires three items and can be done in less than 5 minutes. And it should cost you less than $10. I think mine cost right around $7 each. The only special talent you need to have for this project - being able to fold a piece of paper and press a piece of tape down! Yup - that's it! For the tutorial I am about to show you Lillie and our nine year old neighbor, Chloe did it themselves while I took the photos. I have to say I have LOVED this project and had so much fun with it that we've already made five different ones (three for the porch - one we switched out, one for Lillie's room, and this one for Chloe and Bayley). That being said these don't really replace a true canvas. They are great for places like porches, playrooms, kids bedrooms, etc. but personally I probably wouldn't put them in our living room as I think they look a little too "papery" up close. So, if you are looking for the higher end look of canvas I wouldn't try this. As long as you are okay with a fun project that still looks crisp and clean then I think you will like this! I have seen quite a few tutorials on pinterest for a similar look, including this fabulous one from Sugar Bee Crafts that use spray adhesive and mod podge, and house insulation. I think if you can do that right they probably have a slightly more high-end finished look to them but I tried three times to make some using those instructions and just ended up with a wrinkly mess. Not sure if I just rushed through the project too much or if I can blame it on the fact that my helper is three. =) And I couldn't for the life of me get the house insulation to cut in a perfectly straight line - oh well! Either way I wanted the same oversized look but needed it to be easier and here is what I came up with. 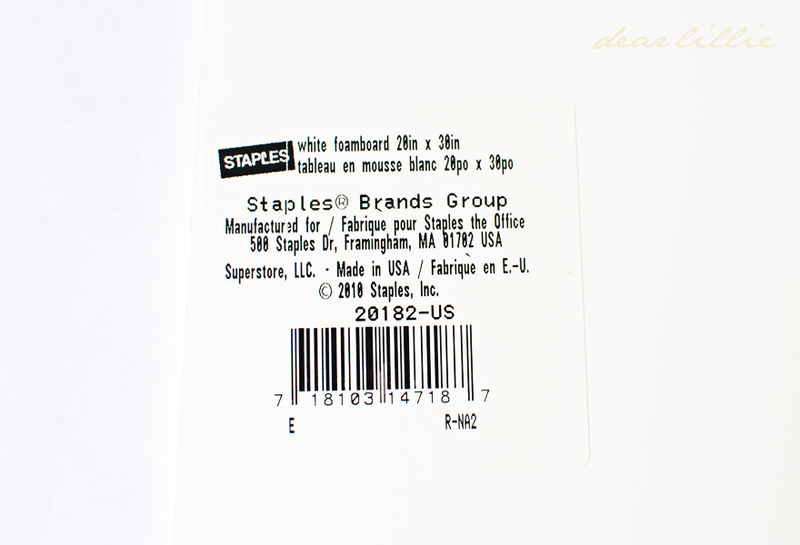 UPDATE: We've had a few people comment that on the Staples website it says the engineering prints are not suitable for photos. It does say that but I just ignored it. I have been completely happy with all but one of the prints. I used high resolution photos for all but one and they were very crisp and sharp. The one that turned out blurry (still usable but just not as crisp as the others) was not as good a quality shot to begin with and that is why it didn't print as well. So, just make sure you are using a high resolution photo and it should be fine! 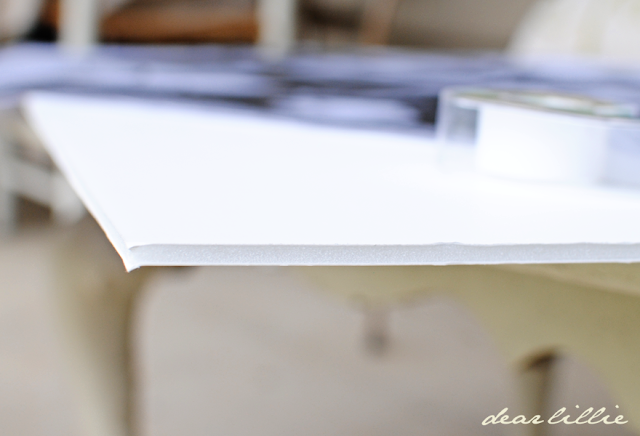 This is the foamboard I used. The 20 by 30 size worked perfectly for me but you could easily trim it down. 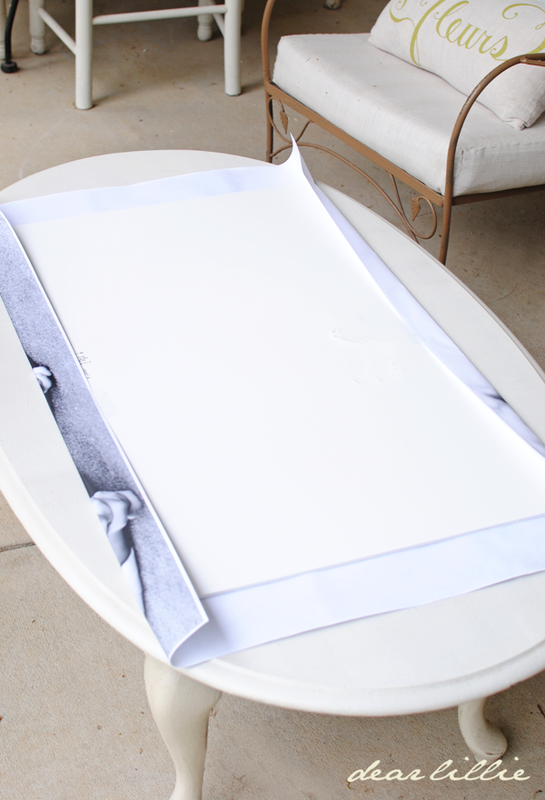 Now, just lay your print face down and then place the foamboard down on top of it in the center. Fold up one long side and tape it in the middle and then pull it as tightly as possible on the other side and tape it. If you would like you could use double stick tape on a few spots on the front to hold it perfectly tight and flat but I didn't bother with that. Then after you fold the long two sides over fold the other two sides and tape them in the middle. Then just fold the corners like this and add more tape. Basically it's like you are wrapping a present. You can just lean it up on a dresser or something like that but if you want to hang it just use any type of string, twine, yarn, etc. and hotglue it on the back. The poster is so lightweight that's all you need! And there you have it! Now just hang it up on a little nail or one of those 3M Command strips. (That's what they are hung on out here on our porch). I have considered adding some mod podge on the top of it but am a little scared too...we'll see. If I do I will update this post and let you all know how it turned out. Here are the girls with the finished product! Lillie and Chloe did this one themselves while Bayley was super sweet and played with Lola while I took the step by step pictures. In between the tutorial shots I got this one of Lola playing peak-a-boo with Bayley on the daybed. If you would like to view more of our tutorials just click here. THAT IS INCREDIBLE!! I LOVE THIS PROJECT...I KNOW WHAT MY PEOPLE ARE GETTING AS PART OF CHRISTMAS THIS YEAR!! (WE DO HANDMADE CHRISTMAS SO IT IS BETTER THAN YOU EVEN KNOW!! )THANKS SO MUCH FOR SHARING THIS!! Jennifer these look fabulous!! LOVE this idea!! Thank you for the tutorial. Jenni the way you capture moments on film are priceless and breath taking. You truly have a gift. And your eye for decorating in exquisite. Jennifer, your little subjects make these large posters priceless! These girls are ADORABLE! You are right, this is a very easy project... and one that makes a huge personal statement! I believe in filling my living spaces with pictures of those I love! Please join me tomorrow evening for the first TUTORIALS TIPS AND TIDBITS at StoneGable. 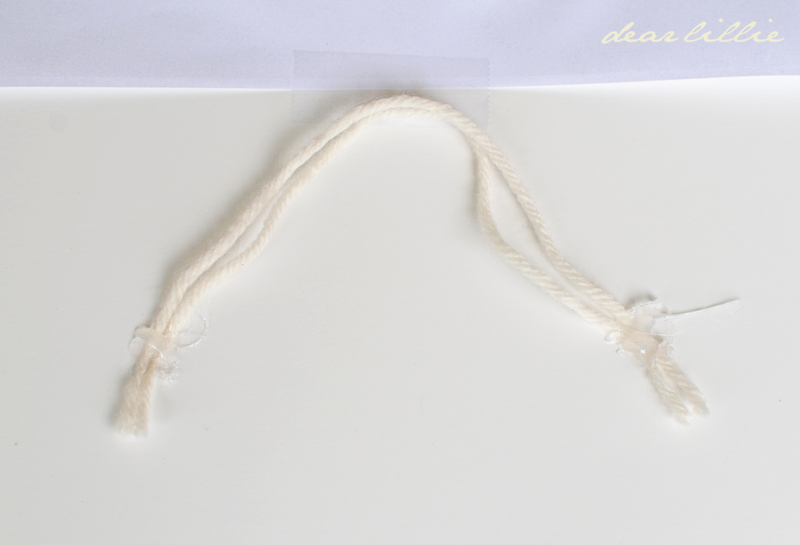 It is a brand new weekly DYI linky party. Your posters would be the prefect addition! Post goes live at 8:00 Wednesday! Thanks! Thank you so much! Can't wait to try this!! Oh, that was easy and so cute too! I did a project for my son's room using spray adhesive and no mod podge and it's held up well. I made a huge canvas, painted it and then sprayed the adhesive onto the back of a giant map that I had ordered from National Geographic. Over time it's gotten a few wrinkles in it, but it still looks really good. I tried it with mod podge first and everything got all wrinkly for me too. Such a cute idea, that I cannot wait to try out! All the girls look adorable, how fun to have such friends! Love it! Question though... 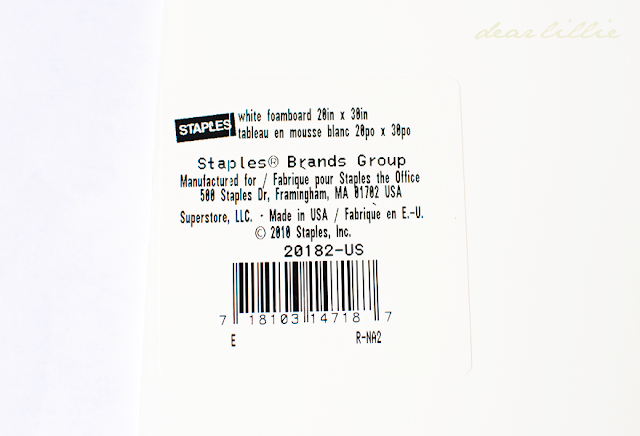 I went to Staples website and it says their engineering prints are not suitable for photo...did you actually do the engineering prints or the oversized photo prints? Thanks for sharing! i read the same thing and am wondering the same thing. I know. I am not sure why it says that. I did use the Engineering Prints and was completely happy with them. I am sure the oversized photo prints are a better paper and quality but there was a HUGE price difference. I have already made five of these and was thrilled with how four of them printed. One of them was a little blurry but that's because the photo itself was not as good quality as the other four. I would definitely recommend using a high resolution photo! Other than that though I was very pleased with how they turned out. So cute!!! Will have to try that one! Fantastic!!! I love big prints so much, but I love cheap even more. This is like a perfect marriage of both :) thanks for the tut! Soooo, you just sent the image to Staples, and they printed it this size for you??? 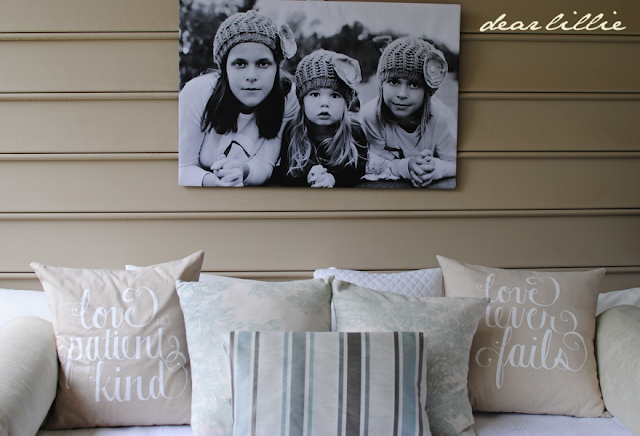 What an amazing and easy way to add these delightful images to a room... Thanks for walking us through it, love this idea! Yes! They have three size options for this type of Engineering Print. I chose the 24 by 36 option for $2.99. Hmm...I couldn't find anywhere that had the different size options, and I'm on the engineering print page...any tips for me? Once you have uploaded your photo click on the "Media" button on the Print Options and it will give you the three size options. Then just check the one you want. wellll thats adorable...thank you for this ! I have a few pics I think I would do this with, for summer on the porch Thank you!.. I have spent the last HOUR AND A HALF stalking through your blog!!! I'm so thrilled I found you! some of my fave Pinterest images had your watermark, so I finally came over and am in love. :) And love this project too! I did something similar in my daughter's room a year ago and it's holding strong. Those look so nice on the porch! Nice easy summer project too! This is just gorgeous!!! It adds so much to the porch! Hope you are doing well. Great idea! I hope to do this soon! Should the picture be saved a certain resolution for 24x36 print? I would make sure you use a very high resolution shot! Of the five I did (and I actually printed one other image a few months ago as well) all of them but one turned out very crisp and sharp. One of them, though, was not as great a quality shot so it was a little on the blurry side. Great job, poarch looks great! These are wonderful! I can't wait to give it a try. I have the perefct photo which is a favorite of mine. 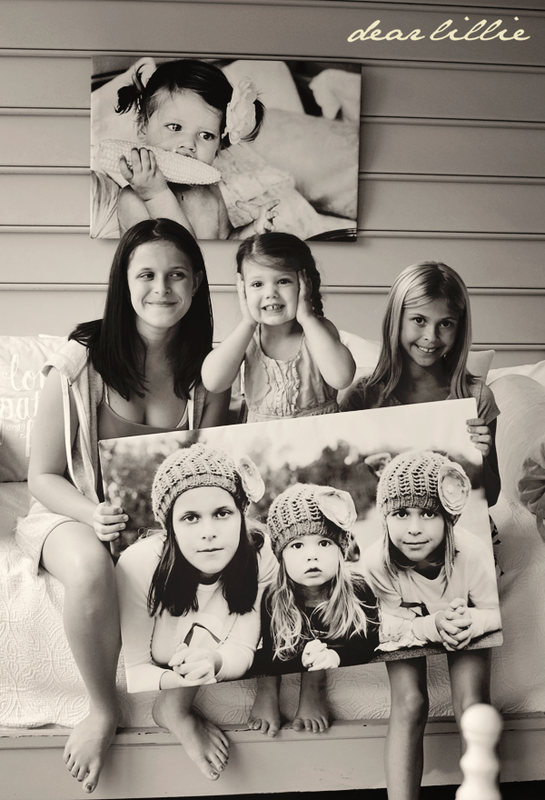 It's a photo of my Mom, my sister and me. A special day for the three of us. This would make a lovely gift for my sister, too. Thank you for your great tutorial! It's done! I uploaded my picture to Staples last night (engineering print - which of course says it doesn't work with photos but it so did). I picked it up tonight along with foamboard and tada - it's done! And it turned out great! Thanks for the tutorial - creative, easy and cheap just my speed. YAY!!!! So glad you did it and liked it! It makes you want to do more, doesn't it? Just hung mine on the wall in our eating area - LOVE THIS!!! It took me all of 5 minutes to put it together and hang it! I used Command poster strips - so far so good! Thanks for the awesome and easy idea! I found this/you via Pinterest & am definitely going to give it a try! Thanks. I just did this project today! It turned out great. I made mine black and white, and I will say this: the ink (black) comes off on your hands while you're working with it, so just be careful. My Office Depot accidentally used photo paper (an upgrade, I suppose because they said they wouldn't charge me for it), so maybe that had something to do with it. Thanks for the great tutorial! I also used a 300dpi resolution and all but one turned out just fine. I was concerned about the one anyway, because the original was a hair blurry. I can't wait to try this! Thank you! Love your pictures of the picture too! I really want to try your version. I tried this using adhesive spray and it wrinkled so badly that it ruined the project. It is very difficult with the thin engineering print to get the print to not wrinkle when placing on the foam board. So, here goes, I hope this one works! Yeah - I had the same trouble with the adhesive spray! I am glad to know I'm not the only one - haha! Dido! Made 4 w/ the adhesive spray on plywood type board and only 2 of them turned out. I am defiantly trying it this way this time! Only thing I'm wondering is how can I make a frame for it doing it this way on foam board? Since I made my other ones on wood, I cut and stapled trim pieces around it to make a frame. Not so sure it will work w/ this. Ideas?? I am not sure - maybe just try hot glue? Yes, it is in the copy and print section. If you found the poster prints then you are close. And yes, they are very expensive. The engineering prints are around $2.99 (give or take a little depending on the size you are printing). Hey - Do the images need to be black/white or sepia for Engineering Prints? Yes, engineering prints can only be printed in black and white. I like how in the last picture. The hat is almost bigger then the little guy himself. Could you tell me the resolutions of the pictures? I would love to do this but want to know that the pictures are right. Thank you! I loved the idea of this project so I ordered my print on-line and I got a phone call a few moments later and they no longer print out pictures with engineering printing at our staples in Illinois, they wanted to charge me $40 for color printing. Sorry! I've never had any trouble with them printing mine. Yes, these are out on our covered back porch. I just taped mine as shown in the tutorial and haven't had any issues with moisture and they've been up now for six or seven months. I love this project! Question about the photos - how do you make sure that your print will end up looking like what you see on your own computer screen? I have problems with my photos looking fine on my monitor, but when I send them to be printed, they're so much darker and blah looking. If I send a photo to Staples to be printed (or anywhere for that matter), even if it's b&w, I want to be sure that I'm getting what I want! At least this project is inexpensive so it wouldn't be a huge loss, but the closest Staples is more than 1/2 hour away from me! Hello....just ordering my prints and I have a question. Did you check the box " fit to scale" on the media page at the bottom when the size choices pop up? Love your blog and your house. You are so talented!! Thank you Jill! No, I did not "fit to scale" for this project. For this one I sized my photo in photoshop to be exactly 24 by 36 and then uploaded it to the Staples website. However, if I had not done that I probably would have chosen the "fit to scale" box. Thank you!! I pick mine up on Saturday...I can't wait to see them!! Hi Jennifer, don't know if anyone has already suggested it, but Dollar Tree stores have that foam core board for a buck! You just want to make sure your boards are smaller than your print so you can fold them over the back and tape them down. I didn't use any sealant at all - I just did it exactly as I showed in the instructions. Love this! I'd only worry that with the high humidity here that the tape might not stick for too long. 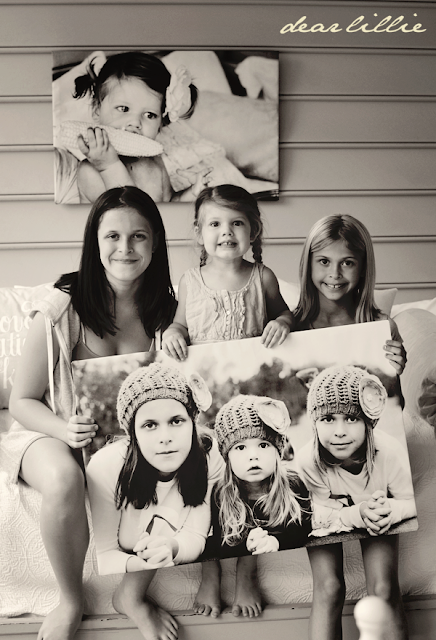 Maybe I'd try stapling or thumb tacking the photo instead, but I LOVE this idea!! Thanks so much. 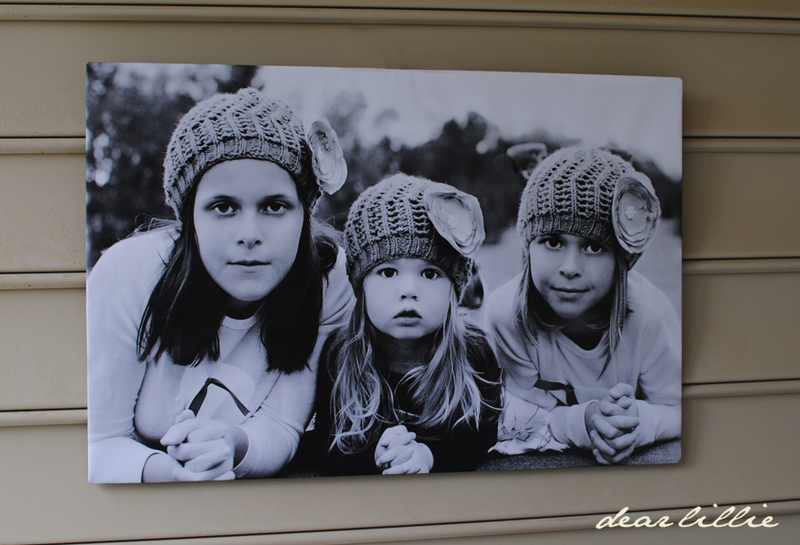 I'd have never dreamed it was so easy to make big wall hangings like this. I was trying to upload my photos using the engineering printing, which there is not a problem uploading them, but when its done, there isn't anything on the screen. I am wondering if they don't do this anymore? 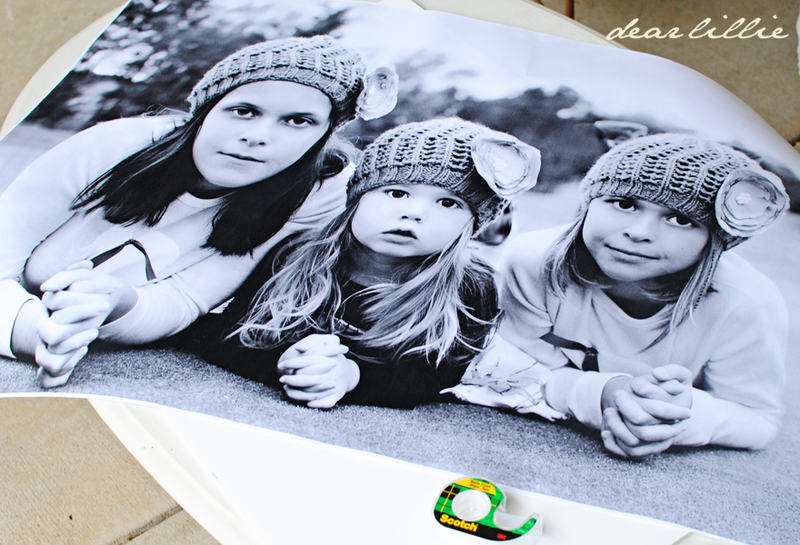 When I uploaded my pictures in the oversized color prints, it worked wonderful. Do you think I need to convert my color pictures to black and white? I've been printing these engineering prints quite regularly. In fact I just printed three last week so I am pretty sure they are still doing them. They will only print in black and white though. Fantastic idea and so cost effective we should all be doing it! Mod Podge will make the paper wrinkle up. I tried it on the engineering prints I did at Office Depot. I was told to use wallpaper paste instead and that doesn't wrinkle up the paper. I still put mine on the wall and it adds texture but am going to try wallpaper paste next time. Yeah, Mod Podge didn't work for me at all either. That's why I just skipped that step. Wallpaper paste is a good idea. 24" by 36" Engineering Print $3.49 at my store and there were 2 long white lines across the picture in different areas :( The employee said that this is due to being an enginnering print for blueprints. So....I dont know if I should try at another Staples. We're sorry to hear your it isn't printing nicely for you at your Staples! You should be able to get a refund from them as the print did not come out as it should have. My best recommendation would be to choose the shipping option on their website. They charge $9 or so to ship (which I know is annoying when you have a Staples right nearby) but that should put the total around $12-$13 which is still a great price for such a huge print. Thanks so much for this idea! There are several things I’ve wanted to make posters of, and my new school doesn’t have a poster printer, so this is awesome! Im not able to upload the picture in rngineer print.how do i go? Won't do this at my staples! Disappointed! We're sorry to hear that your Staples won't print for you! My best recommendation would be to choose the shipping option on their website. Thank you for sharing all your ideas and free printables as well! I am still in school currently and looking for a job, now to start next fall! 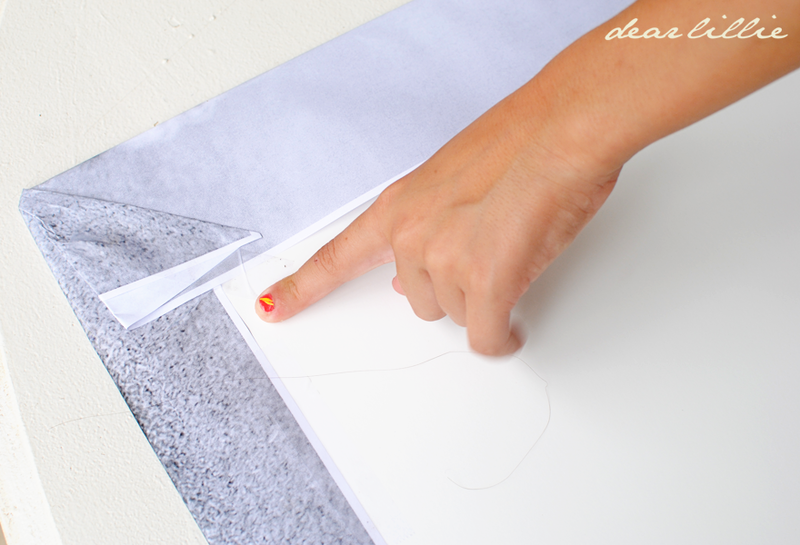 Your creative ideas and posters are such a great help to me to get organized now in advance! THANK YOU! Very awesome! Thank you. You have some beautiful photo subjects too:) we just had an "old time" photo taken I can't wait to do this to.